My friend Crystal and I decided to hit-up JJ's Asian Fusion last night for dinner. Although it's a bit far from the subway, the walk is worth it--even in the biting cold. We loved our dishes and dinner was perfectly affordable, considering the large amount of food we got. JJ's offers wonderful value and equally wonderful food. JJ's is such a lovely, serene place. The calm feeling that came over me as soon as I stepped inside was unmistakable--and this was no accident, as it happened the first time I went there too. The decor is natural and you'll notice a lot of rich, wood accents on the walls. The dining room is separated into three small sections by simple bamboo and wood partitions, which make the space feel even more private. The only downside to JJ's is that it's a little dark but on the upside, that can be quite nice if you're on a date. I'd definitely suggest it for 2nd or 3rd date situation. 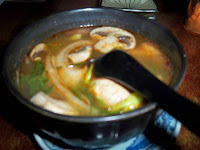 Hot and Sour Soup - As soon as I saw that this soup had a spinach wonton in it, I just had to try it. It was wonderful and very flavorful--full of generously cut veggies such as mushrooms, onions, tomatoes and cilantro. The mushrooms were my favorite ingredient and when I finally found the spinach wonton, it was perfection in my spoon. The spinach filling was very light and used in moderation. I was happy to discover that there was not one but two of these wontons in the soup--it was a nice surprise. Edamame Potstickers - This was Crystal's appetizer--and JJ's signature dish. While I didn't try it this time, I've had it before and liked it. Crystal seemed satisfied with them too and she finished her portion to the last bite. I think that they were a bit filling though because Crystal ended up taking a large portion of her sushi home. 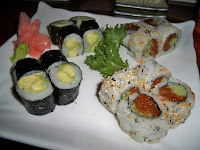 The Sushi - We both ordered sushi rolls, which were fresh and nicely proportioned. 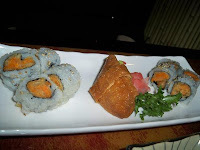 I chose the spicy tuna crunchy roll and an avocado roll while Crystal went for the sweet potato tempura roll. The tuna roll was wonderful and crunchy in all the right places--it didn't feel greasy and there was no fishy aftertaste. But I thought that Crystal's choice was even better! The sweet potato had good consistency--it stayed together well--and its corners were slightly fried. Again, this didn't feel heavy or oily--it was just right. What a great option for vegetarians! Absolutely no complaints about the service--they were quick, attentive and polite. They seemed to know their stuff and ran a tight ship. It looks like JJ's has very good management because the place keeps getting better and better. For the meal that I just described including 2 very full glasses of Pinot Grigio, our total was $39! When we added the tip, it came out to about $24 per person. I think it's a great deal that's worth trying. I love J.J.'s and probably eat dinner there way more often than I should! I highly recommend the Scallops California Roll, Grilled Squid and the Crispy Duck Salad. Sounds wonderful Irene - will have to try those next time.